Density functional theory based studies have been performed to elucidate the role of methanol as an methane hydrate inhibitor. A methane hydrate pentagonal dodecahedron cage’s geometry optimization, natural bond orbital (NBO) analysis, Mullikan charge determination, electrostatic potential evaluation and vibrational frequency calculation with and without the presence of methanol using WB97XD/6-31++G(d,p) have been carried out. Calculated geometrical parameters and interaction energies indicate that methanol destabilizes pentagonal dodecahedron methane hydrate cage (1CH4@512) with and without the presence of sodium ion. NBO analysis and red shift of vibrational frequency reveal that hydrogen bond formation between methanol and water molecules of 1CH4@512 cage is favourable subsequently after breaking its original hydrogen bonded network. Density functional theory (DFT)-based simulations have been performed to provide electronic structure property correlation based reasoning for conceptualizing the effect of encapsulated methane molecule on the formation of methane hydrate cages, the role of methanol and ethylene glycol as inhibitor and the role of tetra-hydro-furan (THF) and cyclopentane as promoter of methane hydrate. 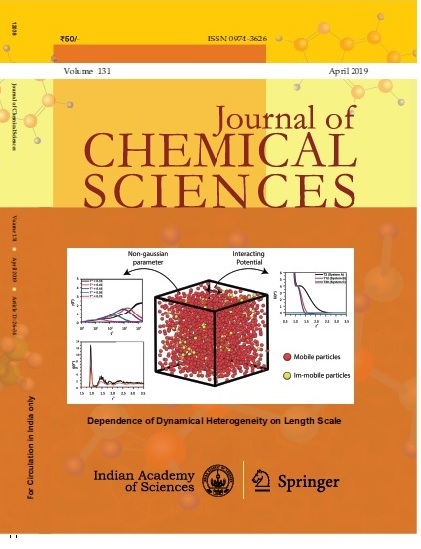 Geometry optimization of 512 cage, 51262 cage and 51264 cage with and without encapsulated methane and the cluster of 512 cage with ethylene glycol, methanol, cyclopentane have been performed by density functional theory using 𝜔B97X-D/6-31++G(d,p) method. Methane hydrate formation inhibition by methanol and ethylene glycol as well as methane hydrate stabilization by cyclopentane and tetrahydrofuran are critically analysed based on the interaction energy, free energy change, dipole moment and infrared frequency calculation. Calculation of free energy change for formation of methane hydrate with/without reagents at various temperature and pressure using optimized structure is reported here. It is observed that hydrogen bond between water molecules of clathrate 512 cages become stronger in the presence of cyclopentane and tetrahydrofuran but weaker/broken in the presence of ethylene glycol and methanol. Simulated results correspond well with experimental findings and can be useful for designing new inhibitor and promoter molecules for gas hydrate formation.